Insects Galore! : Bee Flies Villa sp. This one is very brief. Practically nothing....but I felt I should post it anyway. Villa is a genus of flies belonging to the bee-fly family (Bombyliidae). They range in size from 5 to 17 millimeters (0.20 to 0.67 in), and have typically rounded heads. The males of some species have a brilliant mat of silvery patagial scales. Villa species are found on all continents except Antarctica. 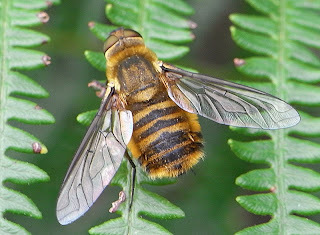 They can be distinguished from similar genera (Hemipenthes) by their wing venation. Once again I'll be digging deeper to see if I can find anything else.